I was booked to return to Luton on flight W6 4452 at 21:30 on a Tuesday. 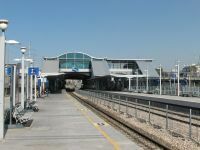 I enjoy train rides, so decided to use the Israeli railways from Jerusalem Mahli station to Ben Gurion airport, changing at Tel Aviv HaHagana station. The train was comfortable, the scenery worth noticing especially through the mountains and I recommend it. The Israelis may be good at high tech but communications is not one of their strengths. The train goes to the international terminal (T3) and then it is a free bus ride to the domestic and low cost redeveloped old gateway. Wizz Air flies outbound from that building, although arrivals are bussed to T3. It appears that in Israel there is as much airport security before check-in procedures as after. For the return flight, I arrived at the terminal some 4hr before scheduled take-off time. Security for the London flight would open 3.5hr before, that is 18:00. I had an hour to kill within a lobby with no cafés and only half a dozen rows of seats. As with all airports, if one wanders off around the corner there is a welcoming space. So it was here, with plenty of seating, few passengers and a couple of clean looking cafés. I enjoyed a croissant and some water, planning to eat aboard the flight home. I was the second passenger for flight W6 4452 to go through security, check-in and passport control fairly quickly. I noted the terminal walls had photographs of many aircraft flown down the years but inside the lobby, one hidden by a plant pot, were two Wizz Air photographs. I was pleased on arrival airside of the terminal to find a pleasant relaxing layout. I could at least see through the window and in the distance an aircraft or two. At the time I was expecting the flight to be called I went to the information screen only to find there was a delay not only for the earlier easyJet flight to Luton but also for Wizz Air. Our departure, scheduled for 21:25, was now expected to be at 00:15, nearly 3hr late. In fairness to Wizz-Air, passengers shortly afterwards were invited to go to the restaurant (actually a snack bar) with boarding passes to claim refreshment. The choices were a croissant, a cake or a savoury item plus any soft drink, tea or coffee. I chose a croissant similar to the one I had eaten a couple of hours before downstairs, and a bottle of water. Wizz Air passengers were the last to be waiting for a flight, long after the duty-free shops and snack bars had closed. There was no need for public announcements when the aircraft was ready for boarding. Everyone quietly went through the gate down to the waiting area. For this flight, two coaches were put on and it was a comfortable transfer, the aircraft much closer to the terminal than on our arrival a few days before. In honour of the inaugural, there was also much greater informality at the bottom of the steps, people being free to walk around and photograph each other and the aircraft and crew. We boarded and the captain was able to taxi for take-off just before 01:00, some 3.5hr late. When all were seated and the boarding closed, he announced that due to the law relating to the working hours of crews we would have to fly to Budapest where there would be a change of crew, the new one waiting to take us on to Luton. 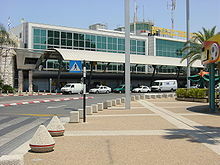 The flight times were considerably longer than we were led to believe – the 2.5hr flight to Budapest was nearly 3hr, the half hour allotted for the crew change and re-fuelling was just over 1hr and the expected 1.5hr onward flight to Luton became just over 2.5hr, making a block time from Tel Aviv to Luton of 6hr 54min. 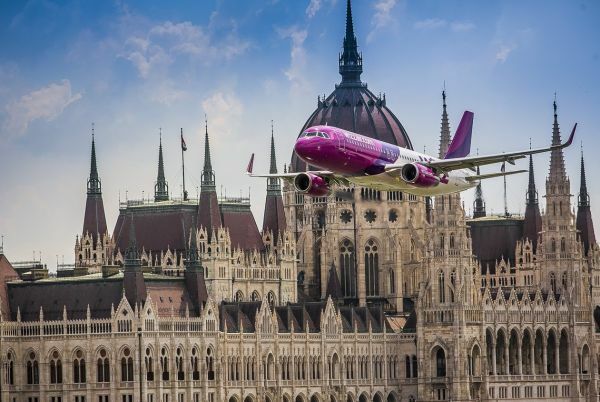 Having written all that, the service was excellent and it was fun at the changeover, with the retiring crew ending up searching for spare seats for their use between Budapest and Luton – they were based in London and wanted to go home! It being the middle of the night, I did not get around to buying another lovely baguette, having enjoyed the refreshment in the terminal. I managed to sleep for an hour or more at one stage. I noticed with interest among the passengers on the return flight a considerable number of Orthodox Jews and Muslims in traditional dress. In the early days of my flying, the variety of dress seen at airports was varied and wide. In so many airports around the world now, passengers appear to be using Western attire – jeans (with holes in) and t-shirts and caps worn back to front. I seemed again to be the only man in Western dress wearing a tie. As I stepped off the plane I thanked the crew for the “enjoyable night” and the two flights with Wizzair experienced over the weekend. I stepped off into a drizzle, with mist covering the airport wondering why I had left the beautiful weather in Israel behind.